Award-winning registered dietitian nutritionist and Wellcoach® Certified Health Coach, Jennifer Neily helps people improve health, age gracefully, and have abundant energy to live the lifestyle of their dreams. After seven years as a dietitian at Parkland Hospital working with seriously ill patients, Neily worked over five years at the world-renowned Cooper Clinic. Since 2009, she has been in private practice as a coach, public speaker, writer, and teacher. Neily works with local and national media and in social media providing unbiased, relevant health and nutrition information. Neily is a foster mom to Great Danes. For 15+ years, she has lovingly cared for 48 gentle giants as they’ve awaited adoption. She lives in Dallas, Texas. In my practice I’ve been remarkably successful helping my clients build a healthy relationship with food so they can forever break their never-ending diet cycle. The kicker is they do this without giving up their most pleasurable favorite foods. Managing weight is not easy. Trust me. I know. I maintain a healthy weight but it takes work and always has. I’ve grappled with my own challenges for years—starting with my first diet as an adolescent. A chunky kid getting teased by my brothers growing up was tough. My mom, bless her heart, didn’t have a weight problem but knew I suffered from the teasing. We went on diets together. 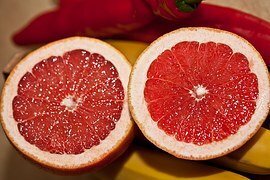 I remember something with eggs, then grapefruit, and everything in-between. Sound familiar? Eating one of the chews and expecting a miracle? Oh goodness. If only I knew then what I know now. Weight Watchers set my weight goal. Thinking back, I shake my head—I fixated on my weight goal. Having lost six pounds the first week, I was one of the most successful at my meeting. I could have been the Weight Watchers’ poster child. By the time summer ended and school started I had lost 30-40 pounds. High school. New people. Some kids knew me and may have commented on my change, but honestly? I don’t remember and probably brushed it off. Until the Weight Watcher scale read “the magic number,” I was still fat. In my head. If people looked at me it wasn’t because they found me attractive it was because they were looking at my overweight body—at least that’s what I thought. And dating? One of my brothers was a star athlete and had some oh-so-fine-looking friends. But dating them? Oh no, (a) they were afraid he’d beat the heck out of them if they hit on me and (b) my self-esteem was so low, I didn’t think I was worthy of their attention, yet I craved it. Through the years I struggled with my weight. College came and with that drinking. So I would gain weight, quit drinking, lose weight, start drinking, quit, lose, and the cycle continued until I gave up alcohol completely. Putting down alcohol seemed easy compared to putting down my fork. Through the years I recognized it wasn’t the food as much as what was driving me to eat. There were issues. Issues best addressed by a professional. I got help. Twenty-four years ago, in an established and successful business career, I was at a place in my life where I was tired of dieting. Quite honestly? Really confused about what to eat. I didn’t know what to believe. One day I would read what one “expert” would say. The next day I would read or hear another “expert” say something entirely different. It was so confusing. Who was right? I needed to learn more. Based on cold, hard facts, reality had struck. I made a life-changing decision—while letting go of a wicked 2-pack a day smoking habit, a crutch used to help manage my weight. Back to school. I received a Master of Science in Exercise and Sports Nutrition and became a respected registered dietitian nutritionist (RDN) and later a Wellcoach® Certified Health Coach. During my journey I realized being healthy and full of energy was not about restriction, dieting, good foods/bad foods but about empowerment, freedom, and guilt-free eating. Being able to help people has been my lifelong dream. Grad school and my career change were the best decisions I ever made. But they were my decisions. What are yours? In my coaching practice I work with people helping them build a healthy relationship with food. The end result? They end their diet cycle forever, without giving up their favorite most pleasurable foods. Learn more! As a registered dietitian nutritionist (RDN) my education is grounded in science, not the fad-of-the-day. My work with you is built on evidence-based medicine. In our coaching relationship we will assess where you are now and where you want to be. With that determined, we’ll coach the gap that exists between the present and the future. The gap is where we strategize, plan, and offer new options for you. A person generally works with a coach either to add something to their life (e.g., healthy behaviors) or to get rid of something (e.g., negative behaviors). With my help you will be encouraged to develop your action plan. I will use my insight, experience and logic to support you in your nutrition, health and wellness vision. Received my Masters of Science (MS) in Exercise and Sports Nutrition from Texas Woman’s University and became a Registered Dietitian Nutritionist (RDN). Worked as a clinical dietitian at Dallas’s Parkland Memorial Hospital. This gave me a rock-solid foundation and profound experiences working with a very unhealthy and ill population. Served under the leadership of Dr. Kenneth H. Cooper of the world-renown Cooper Clinic in Dallas. Focusing on wellness and disease prevention, I provided nutrition therapy and coaching to over two-thousand patients. Received my health coaching certification from Wellcoaches®. Founded in 2002 in collaboration with the American College of Sports Medicine, Wellcoaches® is at the forefront of establishing coaching science in the U.S. and is setting the gold standard for health and wellness coaches. Have appeared in hundreds of media interviews—print, radio, TV, internet, etc. See In the Media for more info. 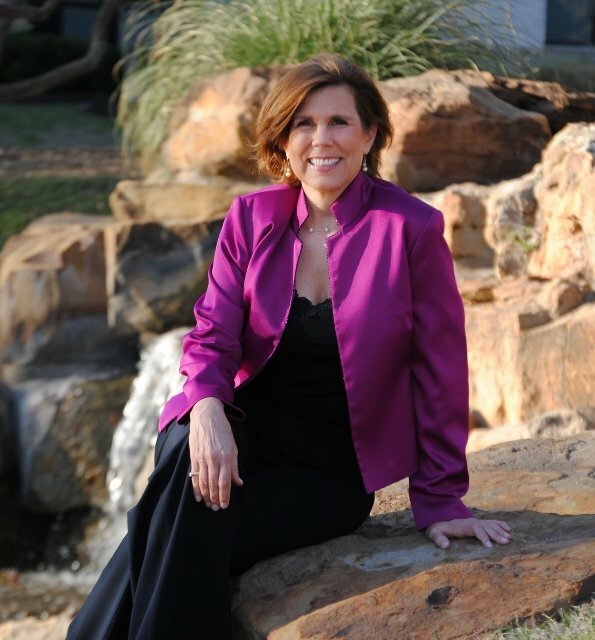 Adjunct (part-time) professor since 1998 teaching Nutrition and Diet Therapy at Richland College and also at the University of Dallas since 2013. Recipient of numerous awards including being the youngest member of the Dallas Academy of Nutrition and Dietetics to receive the Lifetime Achievement Award. So, believe me, I get it! Also believe, I can help you. Learn more! When I’m not coaching, writing, speaking, or volunteering, I balance my time by living what I coach—eating right while maintaining a healthy weight. I don’t eat perfectly and don’t expect my clients to. I loathe the words “cheat meals” or “cheat days.” No. No. No. Life is to be fully lived, at times celebrating with fun meals. Guilt-free eating. For me, I love a good burger and fries on rare occasions. And, of course, sweet treats. Conscious decisions. On a different note, my heart is huge for animals. I cry—all too easily—with any mistreatment of them. There are movi es I won’t see because I know the sad ending. World-class wuss. That’s me. 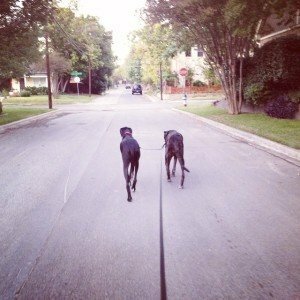 You may find me walking my old east Dallas neighborhood with my foster Great Danes. They’re my “bodyguards” although they wouldn’t hurt a flea. For over 15 years I’ve taken care of 48 gentle giants as they’ve awaited Great Dane Rescue of North Texas finding their perfect forever-family. One last tidbit about me. What’s on your bucket list? 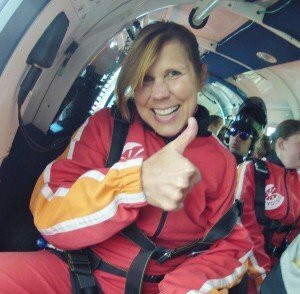 Skydiving was on mine. Check. Done! And yes, would do it again. To learn more about my other services, head on over to my Writing, Speaking, and Media Expert pages.